Members of the Haredi (ultra-Orthodox) population group in Israel appear to have longer life expectancy and report better health than would be expected given their socioeconomic status. Researchers Dov Chernichovsky and Chen Sharony attribute this unexpected phenomenon to high levels of social capital in the Haredi community. Most studies show a positive significant correlation between socioeconomic status and life expectancy. Put simply, on average, the higher a person’s income, the longer he or she is likely to live. Nevertheless, in a study published in The State of the Nation Report 2015, Taub Center researchers find that life expectancy is actually higher in cities and towns with a large concentration of Haredim than would be expected given these cities’ low socioeconomic status. The study, entitled “The Relationship Between Social Capital and Health in the Haredi Sector,” takes an in-depth look at this and other indicators of good health in the Haredi community and explores the factors that may contribute to this surprising phenomenon. The Haredi community is a distinct population group in Israel for a number of reasons. Haredim comprised about 9.5% of the total Israeli population as of 2012 and often live either in Haredi-only cities or in separate neighborhoods in mixed cities. The Haredi labor market participation rate is relatively low – a little over 60%, compared with a little over 70% for the rest of the Jewish population. Furthermore, the average income in the Haredi community is notably low, with Haredi net income standing at NIS 7,500 per household, versus NIS 11,700 for other Jews (as of 2012). The Haredi household’s primary source of income is generally the wife’s salary, as many Haredi men study in kollels (advanced Talmud study institutes). In recent years, more Haredi men have been working, but the share is still fairly low and falls behind those of women in the community. Because of these factors, Haredi communities are characterized by low socioeconomic status and, given the academic literature, we might thus expect relatively poor health among Haredim. The study points to two different indicators that demonstrate that the Haredi population is actually healthier than their socioeconomic status would predict: self-reported health status and life expectancy. Chernichovsky and Sharony show that, in the Central Bureau of Statistics’ Social Survey 2012, more Haredim reported good health than did those in other population groups and fewer Haredim reported health problems than did those in other population groups. As can be seen in the table, 73.6% of Haredim who participated in the survey characterized their health as “very good,” compared with about 50% in the other population groups; whereas only 18.7% of Haredim reported a health problem of any kind, compared with double that figure or more in the other groups. The Haredi community is relatively young and young people tend to have better health. Nonetheless, even when accounting for the young Haredi population, the differences between Haredim and other groups remained substantial: 64.6% of Haredim described their health as “very good” compared with 51-55% of (non-Haredi) religious, traditional and secular respondents. 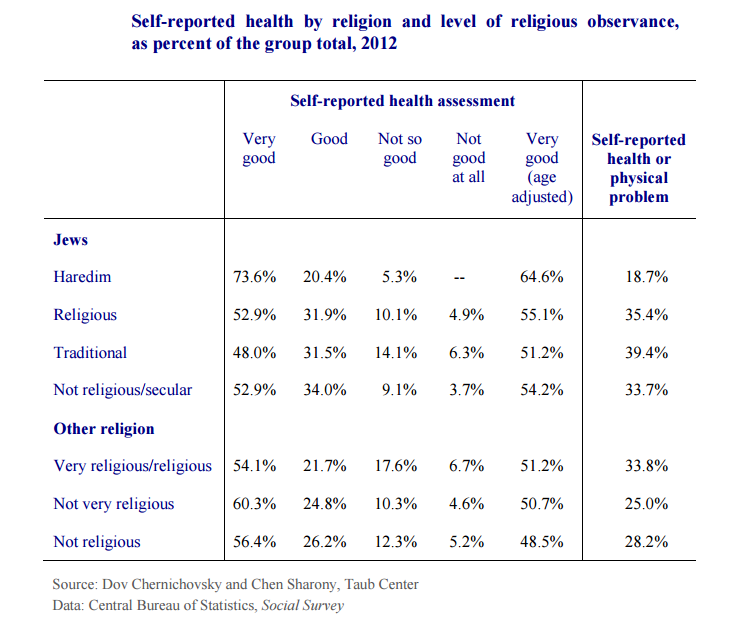 It is interesting to note that non-Jewish religious groups (Muslims, Christians, and others) show no substantial differences in reported health status between the religious and the non-religious. In fact, a higher percentage of religious individuals of other faiths reported a health or physical problem than among the non-religious. Of course, self-reported survey responses are a somewhat subjective method of determining the health of a population group. It is possible that the results contain bias and that these positive self-reports are due, at least in part, to a social norm in the Haredi community that frowns on “airing one’s dirty laundry” in the context of a secular survey. Therefore, Chernichovsky and Sharony also look at the more objective measure of life expectancy rates in cities with populations over 50,000 residents. The correlation between socioeconomic status and life expectancy can be seen clearly in the graph below, where most cities fall on or near the overall trend line. 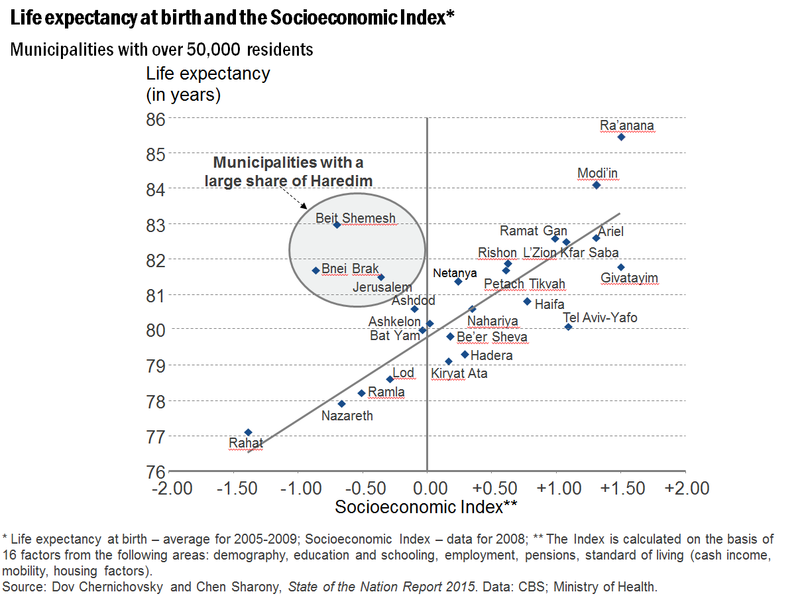 The three largest outliers – cities with longer life expectancy than would be predicted based on their income – all have a disproportionately large percentage of Haredim – Bnei Brak (95%), Beit Shemesh (46%) and Jerusalem (31%). 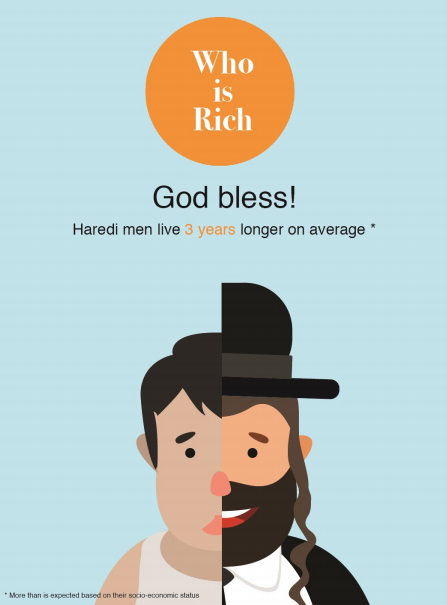 On average, the study concludes that life expectancy was three years higher among Haredi men in these three cities than would be expected based on their socioeconomic status. Among Haredi women, life expectancy was 1.5 years higher than would be expected based on their socioeconomic status. Chernichovsky and Sharony propose that the relatively good health of Haredim is related to the fact that these communities have high levels of social capital. Social capital implies social trust, norms, and networks and includes aspects of life common to the Haredim: a high number of social relationships, high levels of satisfaction with family relationships, strong social support systems, and high levels of volunteering. Also, a relatively low percentage of Haredim report feelings of loneliness (less than half of the percentage reporting feelings of loneliness in other population groups). The findings regarding the unexpectedly good health status of Israeli Haredim, given their socioeconomic standing, provide additional support for the hypothesis that social cohesion at any level of income supports good health and higher than predicted life expectancy in low-income communities.